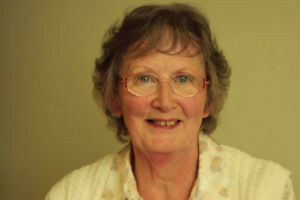 Kathline Callister knew the Manx dialect poet, Kathleen Faragher, from her youth in Glen Mona. She can still recall the manner in which Faragher would perform her poetry, emulating the particular way in which the women of Maughold would speak at that time. Here’s Kathline Callister uses this knowledge to read one of her favourite of Faragher’s poems, At the Airport. This is an extract from the oral history interview with Kathline Callister, which is available here.